This hysterical play, based on a true-life experience, a man discovers his inner self in more ways than one. A near tragedy is masterfully transformed into a one-man comedy, perfectly portrayed by Ed Asner in his hilarious visit to the hospital in preparation for surgery he doesn’t want. Don't miss this once-in-a-lifetime chance to see Ed Asner perform! His most dedicated fans will enjoy VIP seating (front and center), a meet & greet with Ed himself, and a free drink. 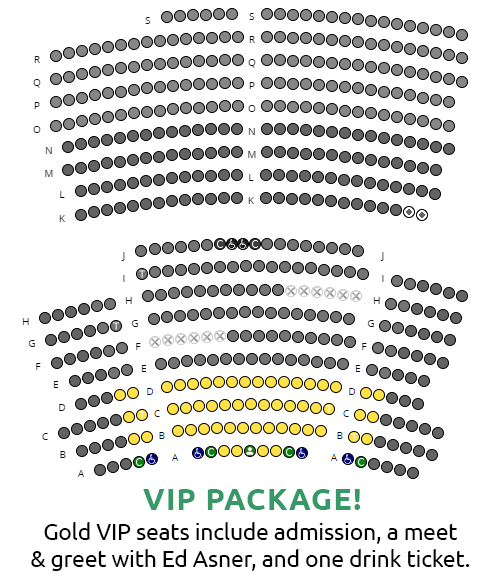 To purchase the VIP Package: select from the GOLD seat option on the seating chart. Yitzhak Edward Asner, an American actor primarily known for his role as Lou Grant during the 1970s and early 1980s, on both The Mary Tyler Moore Show and its spin-off series Lou Grant, making him one of the few television actors to portray the same leading character in both a comedy and a drama. He is also known for portraying Santa Claus in the comedy film Elf (2003) and its animated remake Elf: Buddy's Musical Christmas (2014). He is the most honored male performer in the history of the Primetime Emmy Awards, having won seven. Assisted Listening devices will be available for this performance.